In 1956 I was fortunate enough to witness what I was told was the next to last landing and the last take-off of the last operational B-36. The event took place at Scott AFB while I was attending tech school. The aircraft was being ferried to the AF Museum at Wright-Patterson AFB when it developed an in-flight emergency and had to land at Scott AFB to effect repairs. 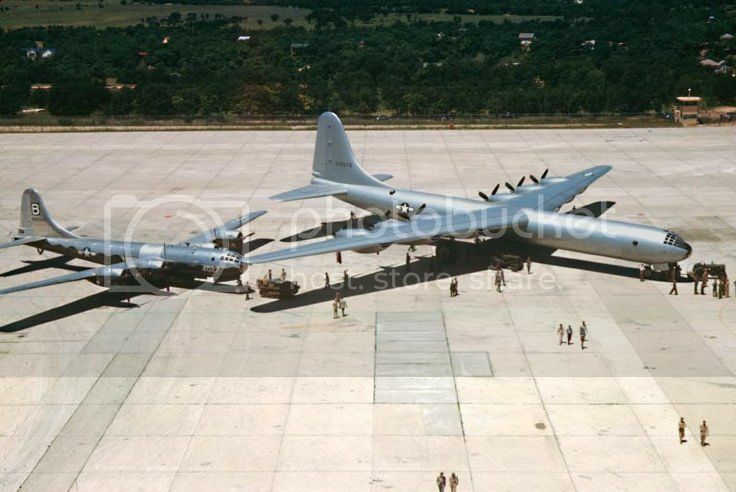 It was so heavy that it could NOT be parked on an apron as it would have cracked the concrete, so it was kept on the end of one of the runways (which had thicker concrete). It had to be moved around every couple of hours to prevent runway damage. When it departed the next stop was it’s final landing at the Museum where it would become a display and never fly again. The take-off was memorable and I will never forget that sight and sound; six piston engines roaring at full strength and the four jet engines screaming. Imagine 36 hour flights in this machine. The view is from one of the two flight engineer positions from their consoles. They took care of the 6 turning and burning with the engine controls in front of them (manifold pressure and throttles, the pilot has the four jet engine controls over his right shoulder. I'd love to have seen the start up procedure, looks like six fingers on all three hands were needed. 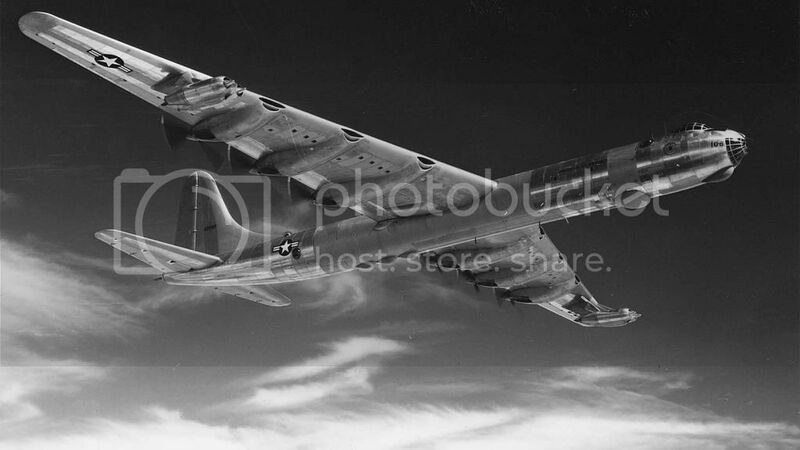 Called "The Peacemaker," the US Air Force B-36 served from late 1940’s until the mid 1950’s when the all- jet B-47 became the long-range nuclear weapon carrier. The B-36 was a state of the art airplane in its day. 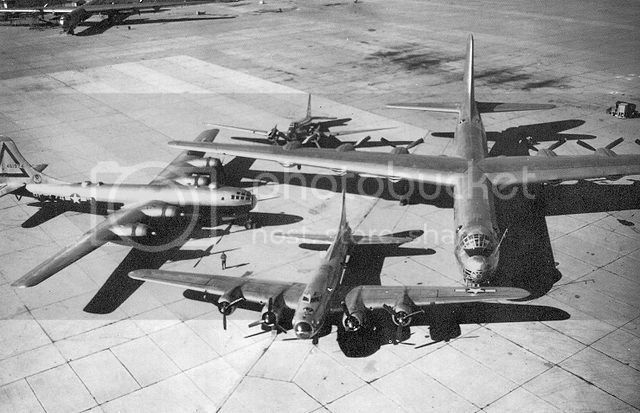 The Flight Engineer was responsible for starting, maintaining and shutting down the 6 Radial Engines and 4 Jet Engines required to make it fly and to mission complete. No modern "Fly by Wire" or "Computer controlled Aircraft" involved here. Just straight old manpower, brainpower and the guts to get it done. Though some of its pilots thought it was a beast to fly, it DID help do the job of keeping the peace during the beginning of the Cold War. This presentation is a 360 degree viewing movement by moving your mouse. 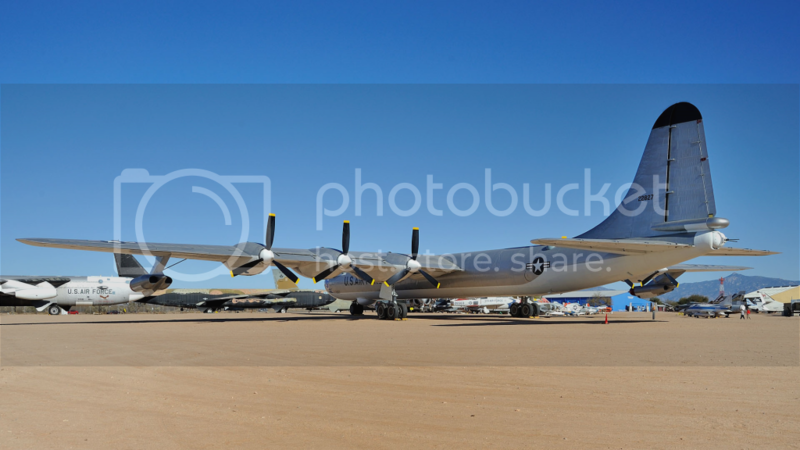 It is a 360 degree panorama of the flight engineers station and cockpit on a B-36. Six propeller-driven R-4360s and four J-47 jets to keep an eye on, plus fuel, pressurization, hydraulics, electrical, and other systems. Use your mouse to navigate the cockpit. Finally, check out this incredible SAC video. That's Jimmy Stewart in the jump seat. Sorry about the ads and other junk. Happy cockpit viewing above and weapons systems below.! By the way, that first picture is great, love that angle, don't see it a lot. Yeah, I saw one fly overhead. And, remember, the Air Force tried a tank-tread type of landing gear meant to be used in the arctic. Treads instead of wheels.